Set in the heart of the city, Jamie's Italian restaurant in Manchester occupies a magnificent grade II listed building dubbed the 'King of King Street'. With room for up to 240 people on the ground floor and mezzanine of this old bank, many of the original features and fittings have been kept, making it the perfect spot for a really unique dining experience. 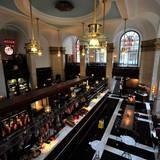 It's worth a visit just to see the huge windows and stately pillars – and, of course, for our delicious food! We have three rooms to choose from and can cater for groups from 5 - 20 in our unique spaces. We never charge a hire fee so you can spend your full budget on our delicious food and drink. Please fill in your information below and Bill Brock will contact you as soon as possible to book your event. If you’d prefer to talk now, please call us at 020 3757 7773.